By all accounts, Trinidad and Tobago is the jewel of the Caribbean when it comes to telecom infrastructure and connectivity. It has a larger percentage of its population connected than anywhere else in the region and is currently benefitting from increased competition that is increasing digital speeds while driving down prices. “We’re way ahead on the internet side,” said Rakesh Goswami, EVP of strategic alliance, enterprise, and Tobago operations for Telecommunications Services of Trinidad & Tobago (TSTT). The statistics are overwhelming. Trinidad and Tobago has 60 broadband internet subscribers per 100 inhabitants, according to BMI Research, nearly twice as many as the next highest country in the Caribbean, Saint Kitts and Nevis. By comparison, it dwarfs the Dominican Republic and Jamaica, which have only 12 and 11 subscribers per 100 people, respectively. This goes beyond the Caribbean as well, notes Ignacio Perrone, digital transformation industry manager at San Antonio, Texas-based consulting group Frost and Sullivan. When it comes to fixed-line broadband penetration rate, Trinidad and Tobago boasts numbers twice as high as even Costa Rica and four times larger than the Bahamas. “In many connectivity indicators T&T is better positioned than most Central American and Caribbean markets, in particular main markets like Costa Rica or Panama,” said Perrone. The world of telecoms and internet service providers has been steadily growing over the past decade. In the olden days, the state-controlled TSTT was the only game in town. Due to this, it still controls some 90% of the fixed voice market in the country to this day. But in the mid-2000s, everything started to change. Digicel entered the market to offer an alternative in mobile, then Flow, Massy, and others began to follow as demand grew for all types of services — cellphones, mobile data, cable television — in the nation of 1.3 million. Now, “every man woman and child has one-and-a-half phones,” said Goswami. He notes that this isn’t the same as in the United States or Europe. Smartphone usage has lagged, but he estimates that 40% of the population already has data access on their wireless devices. There may be even more bandwidth being added soon. The nation’s regulator has been talking about introducing another company and auctioning off the 700 megahertz spectrum to add capacity to the market. Given that the single biggest growth area in mobility is data, this spectrum is critical for future growth, so TSTT and all the others have been eagerly awaiting an announcement. Cable and Wireless (C&W) has been the other major player in the market. It has controlled a minority share of TSTT but is now required to sell of that holding since acquiring Columbus International, which operates Flow in Trinidad and Tobago. Things have been complicated further by London-based Liberty Global buying C&W for $5 billion USD to make its big play into the region this. The divestiture is “taking longer than first anticipated,” said Liberty Global CEO John Reid, according to Guardian, but the all the looming changes should be good news for the marketplace. Cable and Wireless, through its C&W Business arm that targets corporate clients, has made vast inroads into the business side of connectivity. It boasts of its managed services portfolio, but the company needs not rely on merely its own marketing to prove its case. C&W Business received Frost and Sullivan’s “Company of the Year” award last December for the Central America and Caribbean region. It stood out above its rivals due to having first-rate data communications, data center services, managed networking, cloud services, and business continuity, said Frost and Sullivan. Just last month, it got another accolade by reaching “platinum partner” status with Florinet. The company was recognized for its “unparalleled skills in the region” when it comes to managed security services in terms of web application firewalls, email security, DDOS protection, and advanced persistent threat protection. Throughout the region, all the major global providers — AT&T, Verizon, Orange — traverse its network, which has been “growing exponentially over the years,” said David D’Oliveira, vice president of C&W Business Trinidad. He has been with the firm since it was Columbus Business, and says its service centers in the region — a security monitoring center, network operating center, and customer services center — are key to everything the firm does. The company is currently building out operations in Trinidad to manage the entire English-speaking portfolio of services. These include connectivity services, cloud-unified communications services (PBXs and others), IT security, IT surveillance, and typical infrastructure services like servers and backup storage. D’Oliveira says that there are many elements that made Trinidad and Tobago the firm’s obvious choice, including its vastly higher education levels compared to regional peers and the overall amount of resources within the country. Even with these players still on the sidelines waiting to make a larger play into the enterprise business, Goswami stresses that there is no lack of choice for companies. 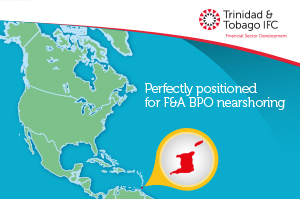 Located in the south of the Caribbean, Trinidad and Tobago has the fortune of being outside of hurricane alley. As these devastating storms move from formation stage on the other side of the Atlantic up the Eastern seaboard of the United States, rarely are the islands affected. This means it avoids the main business continuity concern for places like Puerto Rico, the Dominican Republic, Jamaica, and the Bahamas, which sit on a direct track between Florida and the area near West Africa where hurricanes are born. C&W prides itself on its resiliency, against natural disasters and any other causes of disruption. “C&W owns and operates over 65,000 kilometers of subsea and terrestrial fiber network and eight data centers across the region, offering managed solutions in a redundant and secured environment,” said D’Oliveira. These data centers are housed in Miami, Colombia, Curaçao, and Honduras, among other locations, showing the priority placed on geographic diversity. And for Trinidad and Tobago, this all comes on top of the redundancy provided by its diverse “wetside capacity.” The islands are hooked up to four major underwater sea cables that route through Florida, New York, South America, and other parts of the Caribbean. Of course, the country is not without its challenges. As is typical throughout the Caribbean, Trinidad and Tobago is still working to overcome economic distribution between the haves and the have-nots in terms of residential connectivity. “While in T&T there is a relatively large middle class, there is also a large segment of the population that lacks enough income to afford a PC and to pay the monthly fee of a broadband connection,” said Perrone. Goswami says that this is being improved by TSTT’s hot-spot boxes that can connect up to 10 devices and get up to 5 megabytes of speed even while you’re not at your desk or office. “We use that same technology to connect rural areas where it doesn’t make sense to run wires,” said Goswami. There are about 15 such communities in Trinidad, which can now connect a normal handset to a box offered by the company and, while using voice over internet, make calls and also have a hotspot that provides internet. D’Oliveira also notes the nationwide progress, particularly for corporate clients in the main hubs. Today, his customers are getting upwards of 200-mb internet, with the average client getting 75 to 100 mb and the lowest customer on the business side getting 25 mb. And given how these numbers have spiked in recent years, he only sees more and more growth.